We live in strange times when we don’t have a Ridge Racer or a Koei Warriors game in a console launch lineup. Left standing is EA Sports’ Madden, specifically the PlayStation 4 version of this year’s Madden 25. Unlike with last year’s unfortunate Madden NFL 13 on the Wii U, there’s no indication that any features from the Xbox 360 and PlayStation 3 versions were deleted in the PS4 game. When paging through the multiple menus of modes, I’m reminded of how fully featured Madden 25 was at its initial launch, from the new Connected Franchise mode to Ultimate Team. If one thing can sum up sports games in 2013, it’s that this is the year of the foot plant. Seeing players stop for a microsecond to plant their feet to change directions is a subtle but huge change. It looks like athletes are actually running on the field or court. It’s all the more meaningful to positions like running backs, who have to negotiate their way past defenders with effective jukes. It has been my favorite improvement to Madden 25, and it takes only a couple of game sessions to get used to; unlearning the decade-old feeling of players running on smooth surfaces is worth it. 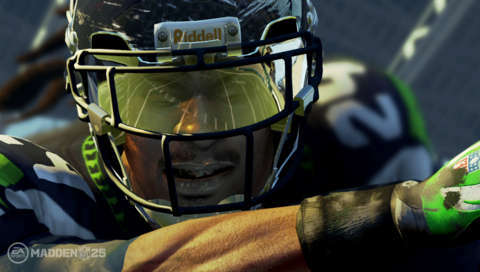 EA Sports hopes that fans will appreciate even more subtle improvements in the PS4 version. Crowds reacting to meaningful plays is long overdue. The audience finally understands what a big deal it is to convert a 3rd-and-long into a first down. The PS4 version is also better at giving life to the sidelines, like press photographers moving along with a play. After half a dozen matches as the 49ers, I realized that it might be a long time before we have a Madden that manages to motion-capture Jim Harbaugh in all his unrestrained animated glory. It’s also satisfying to see receivers put effort into trying to stay inbounds while making a catch, a feature that EA has been trying to figure out for years. With that solved, I’d like the studio to focus on implementing a wider variety of animations when a defender fails at intercepting a ball. Even in 2013, a leaping defender in Madden will still let a ball bounce off his outstretched arms even when he’s out in the open. Crowds reacting to meaningful plays is long overdue. The audience finally understands what a big deal it is to convert a 3rd-and-long into a first down. Madden 25 for the PS4 also introduces a much-improved pass blocking system, though I admit that it would have taken me more time to notice it had it not been for a recent hands-on preview session with EA. I had a better appreciation for this enhancement while watching camera-zoomed replays. This change was especially apparent after I fired up the PlayStation 3 version and saw the marked contrast in the pass blocking, especially during three-man rushes. Regarding PS4-specific functionality, EA makes practical use of the touchpad, allowing you to set a receiver in motion at the line of scrimmage. You can also call timeouts by pressing on the pad. For the standout Madden PS4-specific feature, you have to take yourself out of the console and experience the game on the Vita via Remote Play. Assassin’s Creed IV on the Vita was impressive enough, even if there was a slight video delay between the TV and the Vita. That makes the one-to-one, no-delay Remote Play performance of Madden 25 even better. Remote Play works like a number of games on the Wii U that let you play the entire game using the GamePad screen. Since the Vita doesn’t have L2, R2, L3, and R3 buttons, virtual versions of those inputs can be found on the rear touch. It does take some time to get used to, especially when it feels like the complete opposite level of comfort compared to the excellent PS4 controller. There’s also an understandable reduction in frame rate, but Remote Play is still a welcome convenience if your significant other wants to use the TV. Eight hours into this enhanced port, I’m still conflicted on Madden 25 for the PS4. The visual improvements are noticeable, such as the 3D model crowds, but they aren’t mind-blowing in the way NBA 2K14 is for the PS4. That said, I’m optimistic football fans who put off getting Madden 25 on either the Xbox 360 or PlayStation 3 will find that it was worth the wait. It’s just too bad the $ 10 PS3-to-PS4 upgrade promotion does not extend to Madden 25, even though EA is offering it to Battlefield 4 players. I’ll have both my reviews of Madden 25 on the PlayStation 4 and Xbox One later next week. Tagged Madden, PlayStation, Preview, Progress, Review. « How to Stream to Twitch on a PS4.